Abracadabra! It’s Disney Live! 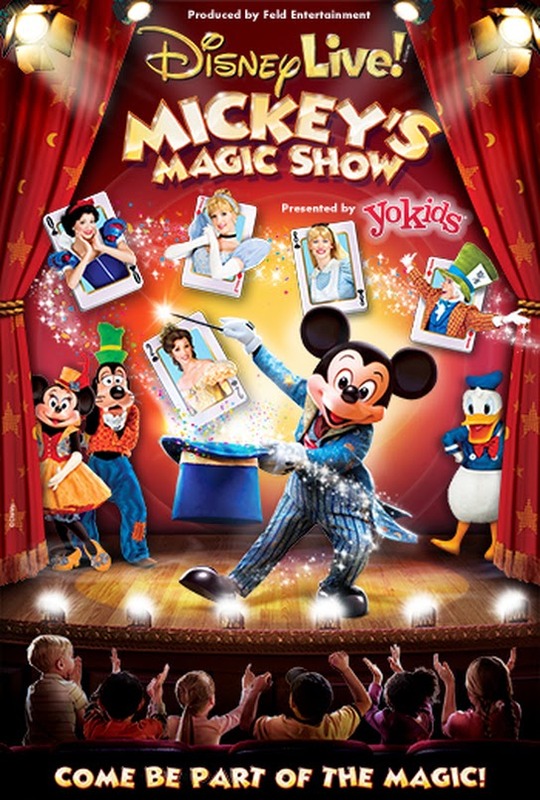 presents Mickey’s Magic Show Presented by Stonyfield YoKids Organic Yogurt! Mickey Mouse, Minnie Mouse and a host of Disney friends come together with a world-class illusionist to perform magic from legendary Disney films right before your eyes. See the Fairy Godmother transform Cinderella’s rags into a beautiful ball gown in a split second; the spectacular levitation of Aladdin’s Princess Jasmine; and the enchanted dancing brooms of Fantasia. Join Donald Duck and Goofy, Alice and the Mad Hatter, and many more for a one-of-a-kind stage show you’ll never forget. Disney Live! presents Mickey’s Magic ShowPresented by Stonyfield YoKids Organic Yogurt is a whole new way to experience Disney magic with your family! This show will be presented ONE DAY ONLY at the Patriot Center (love it because it’s in Fairfax!) Sunday February 22nd at 1pm and 4pm. Giveaway tickets are for the 4pm show only. Tickets are $55 VIP, $35, and $25. Purchase from www.ticketmaster.com, the Patriot Center Box Office or Ticketmaster at 800-745-3000. To win- visit our Facebook page and find the image you see above this post. Click “like”, leave a comment with which character from this post is your child’s favorite, and share the post. I am a Feld Family Ambassador, and in exchange for my time and efforts in attending shows and reporting my opinion within this blog, as well as keeping you advised of the latest discount offers, Feld Entertainment has provided me with complimentary tickets to Feld shows and opportunities to attend private Feld pre-show events. Feld Entertainment is neither a sponsor nor endorser of this promotion. As always- by entering you agree to our Giveaway Rules.